Shaun the Sheep is a British animated series written for television and part of the famous Wallace and Gromit franchise. 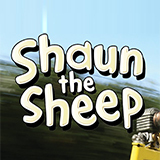 It is about Shaun, a sheep that appeared in various Wallace and Gromit adventures, such as Wallace and Gromit's Cracking Contraptions, and the adventures he has on the small farm where he lives with his flock. Shaun the Sheep proved to be a successful television show and was followed up by various films, and short films, including the Shaun the Sheep Movie for theatres and the 30-minutes Shaun the Sheep: The Farmer's Llamas 2015 Christ,as special. 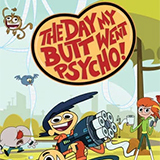 The show, being a spin-off itself, also inspired its own spin-off called Timmy Time, about the adventures of Shaun's younger cousin Timmy. An unusual guest lands on the Farm. When Shaun and Bitzer realise it's hungry, they set about trying to find it some food - if only they could get their hands on the Farmer's prize catch! Shaun comes across a discarded jigsaw puzzle and calls on the Flock to help him put it together. When Bitzer discovers the final piece is missing they decide they must do whatever it takes to solve the puzzle. It's time for the annual dog show and the Farmer is sure Bitzer has a good chance of winning this year. When things don't quite go as planned, the Farmer comes up with an ingenious idea which might help him win. When the Farmer discovers he's sprung a leak, he calls the Water Board to come and fix the problem. The bored Flock are thrilled by the opportunity to have some watery fun. When the workmen clock off, the party begins! Everyone is settling down for the night, when Bitzer begins to act strangely - he just can't sit still. When his peculiar behaviour starts spreading around the Flock, Shaun decides he must find out what's causing it. The Farmer's niece has come to visit, bringing her pet rabbit. When the rabbit disappears Shaun and the Flock are called to action to help track down the illusive pet before the niece discovers it's missing.